This is an archive page; this conference occurred in April 2016. Some photos from the workshop (taken by Maciej Baranowski) are available here. The seventh in a series of biennial workshops on the dialects of Northern England. The 7th Northern Englishes Workshop (NEW7) will be held at the University of Edinburgh on Thursday 14th and Friday 15th of April, 2016. 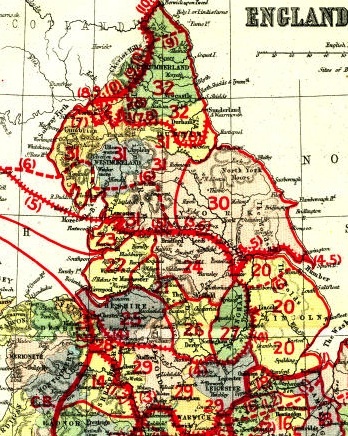 Like previous workshops, NEW7 will focus on research on the linguistic 'North', specifically Northern England (from the English-Scottish border to as far south as you can justify), but NEW7 will exclude research dealing with Scotland and Ireland (unless this concerns relations with Northern England). All aspects of the study of Northern English (dialectological, structural, historical, sociolinguistic, perceptual, etc.) are welcome. Previous workshops were held at Lancaster (2006), Edinburgh (2007), Salford (2008), Sheffield (2010), Nottingham Trent (2012) and Lancaster (2014). In keeping with its workshop nature, both informal presentations/discussions about ongoing research bearing on the issue of English in Northern England and conference-style research presentations are appropriate. NEW7 will include a special half day workshop on the linguistic analysis of Northern English dialect literature. Everyone attending the workshop will need to register in advance and pay the conference fee. The details of how to register are given here. The programme for NEW7, including maps and advice on where to eat and drink, is available here. The abstracts booklet is available here. Everyone attending NEW needs to register in advance and pay the conference fee. The booking system is now closed - contact patrick.honeybone@ed.ac.uk with any queries. For most people, travelling to NEW7 will involve either flying into or getting the train to Edinburgh and then either walking or getting a bus or a taxi to the conference venue (or to your accommodation first, perhaps). It’s easy to get into the city centre from Edinburgh airport: use either the number 100 Airlink bus which leaves every few minutes and which drops you off next to Waverley Station (this is the main Edinburgh train station, and the last stop on the bus journey), or the tram, which costs a little more but is more comfy. In the city centre, the tram stops at Haymarket Station (there are some hotels in that area and around the nearby financial district), Shandwick Place (the stop is called 'West End - Princes Street'), around the middle of Princes Street, St Andrew Square, and York Place on the edge of the New Town (quite close to the YHA hostel if that’s where you’re staying). St Andrew Square is the best stop for the university - it's just a short walk to Waverley Station. Waverley station (the main train station) is a good orientation point. It’s situated right in the centre of the city, between the New Town and the Old Town, just next to Princes Street (Princes Street is the main central shopping street in Edinburgh), and there are normally lots of taxis available at the station (if you want to take a taxi to the conference venue, ask them to take to Bristo Square, next to the McEwan Hall at the university). It’s about 15 minutes’ walk from the station to the university. You need to head south: walk up from the station into the Old Town along Cockburn Street and then up the Royal Mile and along George IV Bridge. NEW7 will take place in the Dugald Stewart Building, which is just off Bristo Square, in the university's central campus. You can find it on a map here. Its postcode (in case you need it for an electronic map) is EH8 9AD. If you need to book accommodation for the symposium, we recommend trying the Kenneth Mackenzie Suite or Richmond Apartments (these are both affiliated to the university and are close to the symposium venue and city centre). The university also has some other types of accommodation at other nearby locations, which may also be worth investigating. If they are full, or you'd like to stay somewhere more luxurious or cheaper, the easiest way to find somewhere is to use one of the many internet accommodation search sites. If you try Trip Advisor, you'll find lots of details and some interesting comments about the hotels (not always to be trusted, but you can probably go by the average opinion). Enter your check-in and check-out dates, select the number of adults staying in the room and click on 'find hotels'. You can select the currency that you’d like to use and you can ‘sort by’ price or popularity. If you click on 'map', you can see where the hotel is – look for one towards the south of the centre. The main YHA hostel in Edinburgh is new and looks nice, although it's a bit of a distance from the conference (30 minutes' walk). There are lots of buses, though. Central Edinburgh is made up of the New Town, to the north, and the Old Town, to the south, with Princes Street and (Princes Street Gardens) in between. Most of the buildings of the University of Edinburgh (including the NEW7 venue) are in the Old Town, towards the south. You should make sure that you have the chance to walk round the city while you're here – it's stunning. Walk up and down the Royal Mile to the castle at the top and the Scottish Parliament at the bottom, walk around the New Town (which starts at Princes Street and carries on northwards for several streets), or walk up Calton Hill and around Holyrood Park. This page is hosted by Linguistics and English Language at the University of Edinburgh. Last updated in April 2016. Responsible for this website: patrick.honeybone@ed.ac.uk.